1. What is Model Binding in MVC? What is Model Binding in MVC? 1. It is much cleaner code and there is no fancy coding. 2. No type casting needed. 3. 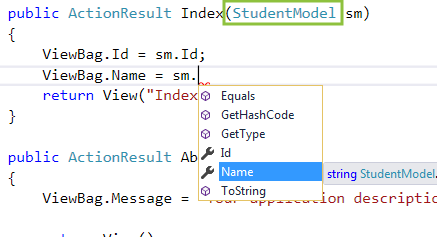 No need to remember model properties because it appears in IntelliSense. 4. Adding and deleting properties from model is easy. Model binding makes all these tasks easy. 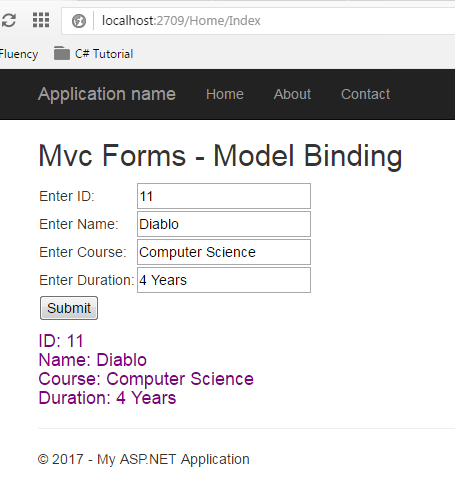 Simply, Model binding means bind your input control to the respective model properties and once it is bound, enjoy the power and simplicity of ASP.NET MVC. Model binding maps incoming data to corresponding model properties. In this tutorial, I will discuss several model binding techniques that will help you in access input data in models and controllers. No Binding means access form data directly without binding form to a specific model. 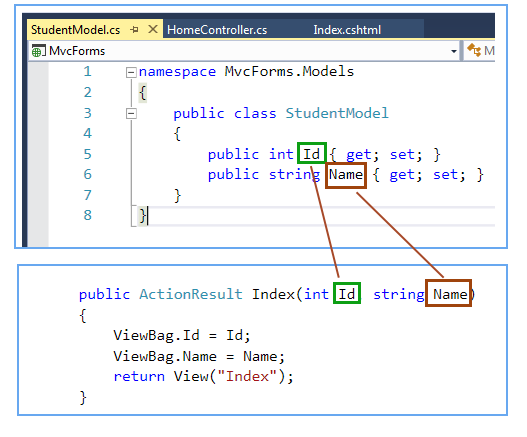 In simple binding, pass the parameter in action method with the same name as model properties and MVC Default Binder will automatically map correct action method for the incoming request. 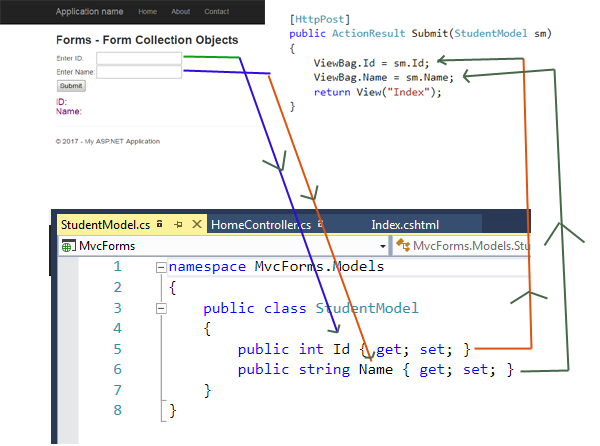 In Class Binding, pass model as a parameter in action method and then access its entire member variable. Complex Binding means apply multiple related models in a single view. Here, in this example, I will show you how to bind multiple models in a single view. Step 1: Create two models class like that. I have added CourseModel as a property in StudentModel, so the StudentModel has right to access CourseModel Property. Step 2: Create Form like that. In this chapter, I discussed model binding in MVC with the help of an easy and simple example. However, there are also various ways by which you can bind views with models and controllers. Just read this chapter, If you are not comfortable in transferring data between models and views.